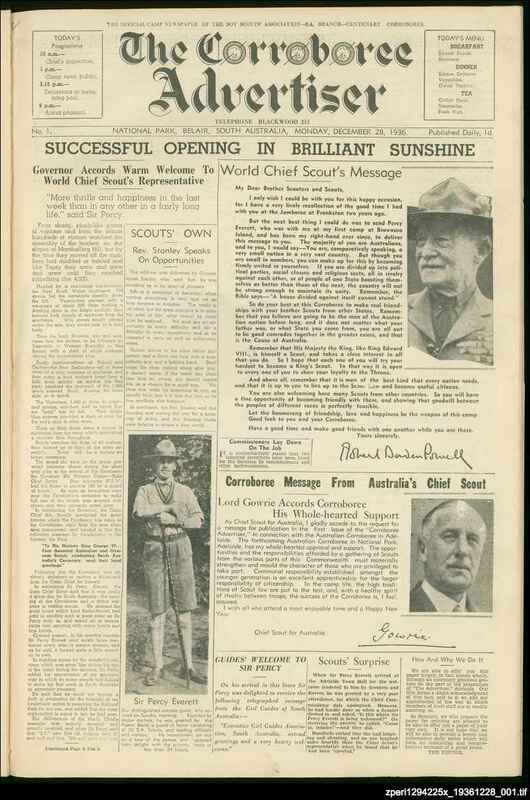 The Corroboree Advertiser was published by the Advertiser newspaper for the 1936 Scouting Jamboree held at Belair. The Boy Scout movement was founded in England in 1907 by Lord Baden-Powell, based on his military experience as an army trainer. In 1908 the movement came to Australia,and a troop was begun at St Peters in the same year, founded by young Gordon Smith and five of his friends with a coachbuilder named John Ivett as their leader. In less than a year there were 400 scouts across South Australia and John Ivett was State Commissioner. By 1937 there were 2.5 million scouts worldwide in almost 50 countries. Today America has the largest scout membership in the world and the Scouts are the world's largest youth organisation. In 1934 the first international gathering of Australian scouts, the Jamboree, was held at Frankston, Victoria. This followed a pattern of international Jamborees started in the UK in 1920. In 1935 the leaders of the South Australian scouting movement began discussing a suitable 'gesture' for the centenary of South Australia's European colonisation in 1936. As a result, a six day camp meeting of 4,000 scouts dubbed the 'Centenary Corroboree' was held in the Belair National Park from 28 December 1936. Scouts from across the Commonwealth (including South Africa, Sri Lanka, the Solomons, Rabaul and Nauru) attended. The souvenir newspaper was sold at one penny per issue.